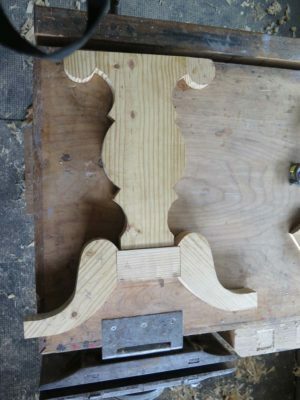 It’s been more than four months since I last wrote about my project to interpret an early 19th century writing desk for a client, when I had the opportunity to use period appropriate technology for virtually the entire project. Previously I had written about deriving the design templates for the project, and this post will finally get down to fashioning wood. My first problem(?) was that I was a bit hazy on some of the internal construction details of the original. To resolve that void, or to at least come to a workable conclusion, I needed to build a full scale prototype. Using some left over 2x SYP from a workbench-building project I did just that. 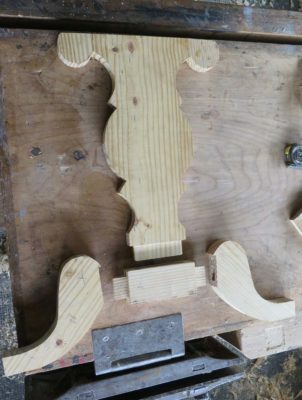 I rough cut each leg element with a bandsaw (this was primarily a proportion and joinery exercise) then shaped them just enough to get the gist of the idea. 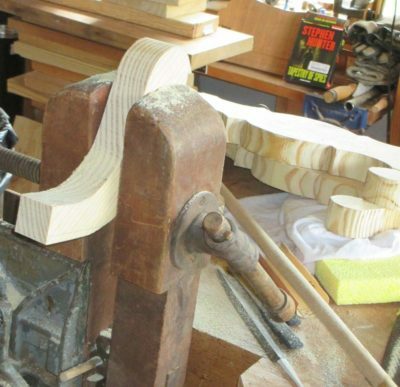 Then with each individual element fashioned I dove into the joinery for the complete leg assembly, with frequent dry fittings. Using PVA I glued up each leg. 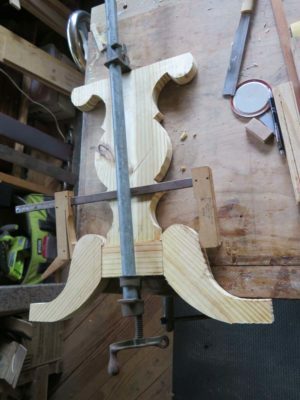 In the end I had two leg assembles shaped and fashioned, and joined, glued, and assembled. This was an important moment as I exerted my full weight on each individual leg to make sure they would hold.